Jim Oertling - Louisiana Gambler (La Louisianne LL-8118) Here we have a nice 1960s country’n’western rocker from Louisiana. An original copy of Jim Oertling’s “Old Moss Back” can be sold for 370$ or more and is extremely valuable. "Louisiana Gambler" is less famous but also very rare. Oertling did not know of his song’s popularity until he was rediscovered and inducted into the Rockabilly Hall of Fame. Oertling’s family originally hailed from Louisiana but moved to Texas eventually, where young Jim was raised. His grandfather bought him a used guitar when he was just ten years old and ever since, music played an important role in his life. The first song he learned was “Streets of Laredo” and Oertling wanted to become a Singing Cowboy. 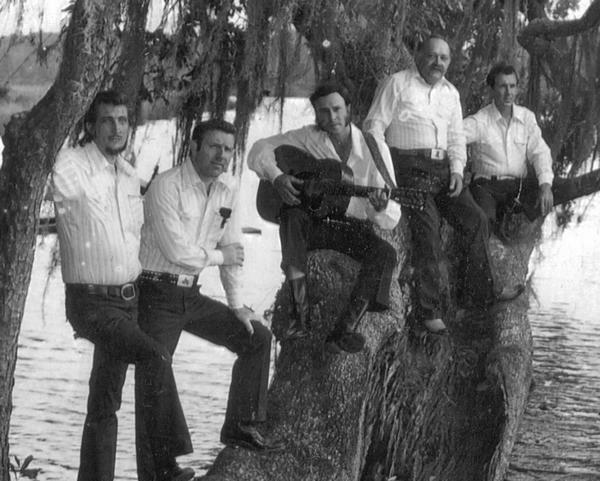 Jim Oerling (center, with guitar) and the Bayou Boys. This photo seems to be taken in the late 1960s or 1970s. Although he visited his home state Louisiana every summer, he eventually moved back there and attended Louisiana State University. While studying, he played guitar in a bluegrass band and wrote a song called “Old Moss Back.” With a band, he began to tour the country and played in bars, honky-tonks, and roadhouses from Biloxi, Mississippi, to San Antonio, Texas. 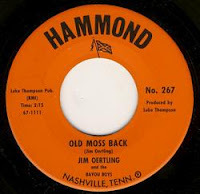 According to Oertling, he and the Bayou Boys recorded “Old Moss Back” in 1963 at Cosimo Matassa’s studio in New Orleans. They just did the record in order to gain more gigs. Coupled with “A Wild Rose,” the song was released on the Baton Rouge, Louisiana, based Hammond label and got a lot of airplay from radio stations. A second pressing of “Old Moss Back” had the instrumental “Rough Surfin’” by the Tarrytons on the flip side with a different label, showing the design of Exclusive Records. This was apparently a mistake or a test pressing by the pressing plant. 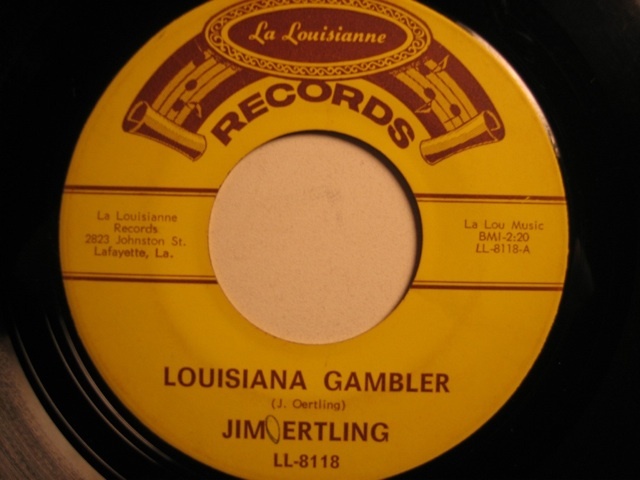 "Louisiana Gambler" was recorded for the beautiful named La Louisianne label out of Lafayette, Louisiana. No release or recording date is reported but this is also certainly from the 1960s. Also in the style of "Old Moss Back," this is another nice rockabilly number which was long out of fashion back then. Oertling went to the Army in 1965, fighting in Vietnam and later becoming a military police captain. He later worked in various jobs, for example as a bank vice president, a horse wrangler and a professional bull rider (which caused him several broken bones) but he never gave up music and song writing. Today, Oertling resides with his third wife in Robert, Louisiana. 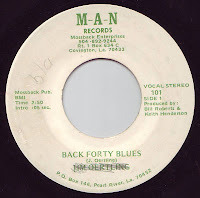 Apart from “Old Moss Back,” Oertling made some other records. Some of them were issued on collector oriented compilations, some of them are still not commercially available. M-A-N was a part of “Mossback Enterprises” from Covington, Louisiana, and was based in Pearl River, Louisiana (P.O. Box 146). “Produced by: Bill Roberts & Keith Henderson.” Was this possibly Oertling’s own label? Very cool: I've always wondered as to the story this guy with the great name (who recorded that chuggin' country bopper about combat with a FISH), so this is quite illuminating. Interesting.. Would like to know where he was stationed in Nam... And w/what outfit.